"My Room" functionality, plus offline replays and preset chat phrases for online added, as well. 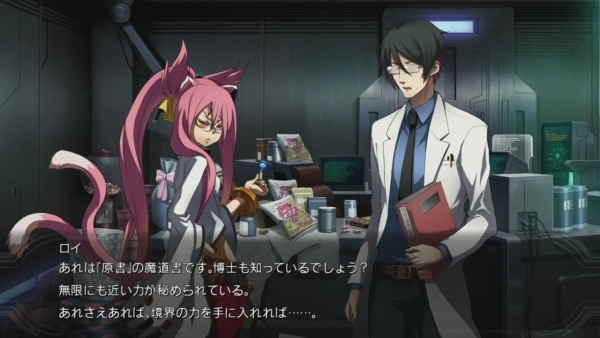 BlazBlue: Chrono Phantasma Extend, the PlayStation 4, Xbox One, PlayStation 3, and PS Vita expansion to BlazBlue: Chrono Phantasma, will include a new story scenario dedicated to Kokonoe, as well as a handful of changes and additions to both its offline and online modes. Like the other new story scenarios set for inclusion, Kokonoe’s scenario depicts events from the Ikaruga Civil War. In contrast to the Bullet and Kagura scenarios that are also planned, Kokonoe’s focuses on the events that led to Roy’s transformation into Arakune, while also featuring an episode in which Azrael finds himself arrested. Gameplay-wise, players in Chrono Phantasma Extend will be able to furnish their own match rooms, which are known as “My Rooms.” Customizable elements include things like wallpaper, flooring, and furniture, among other things, all of which can be changed up to suit each player’s tastes, with the furniture specifically described as varying wildly from the realistic to the unique, with plenty to choose from. The method to unlocking items can vary; while some just require payment with the in-game currency, P$, others require satisfying certain conditions within either the main game or downloadable content to acquire. Beyond that, replays are now set to be savable for offline player matches, while online, functionality has been added to allow players to communicate with one another using various preset phrases from across four different categories. BlazBlue: Chrono Phantasma Extend is due out on April 23 in Japan and this summer in North America.